Messier 83 (M83), also known as the Southern Pinwheel Galaxy, is a barred spiral galaxy located in the southern constellation Hydra. 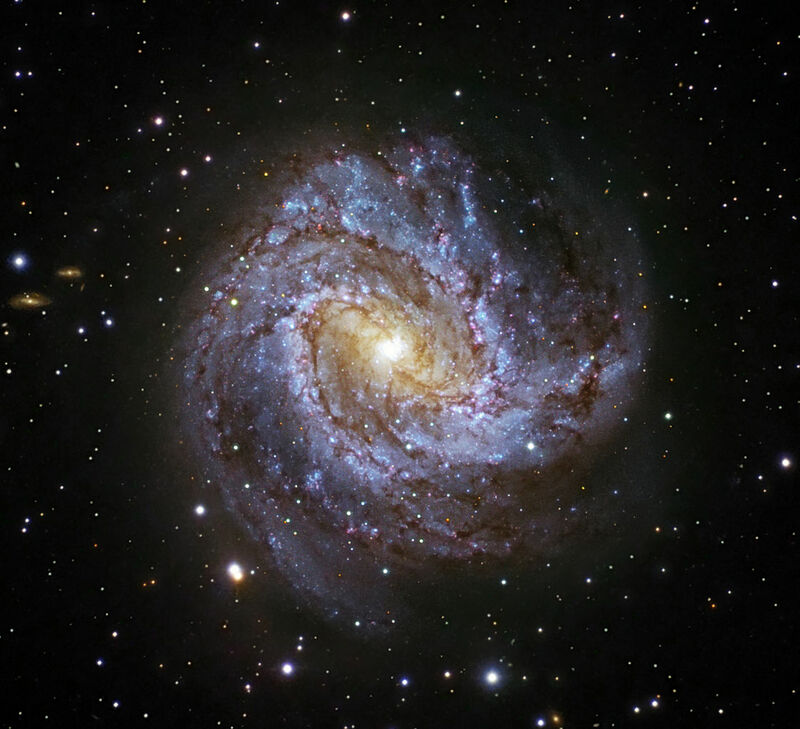 M83 lies at a distance of 15.21 million light years from Earth and has an apparent magnitude of 7.54. It has the designation NGC 5236 in the New General Catalogue. The Southern Pinwheel Galaxy occupies an area of 12.9 by 11.5 arc minutes of apparent sky, which corresponds to a spatial diameter of about 55,000 light years, or roughly half the size of the Milky Way. 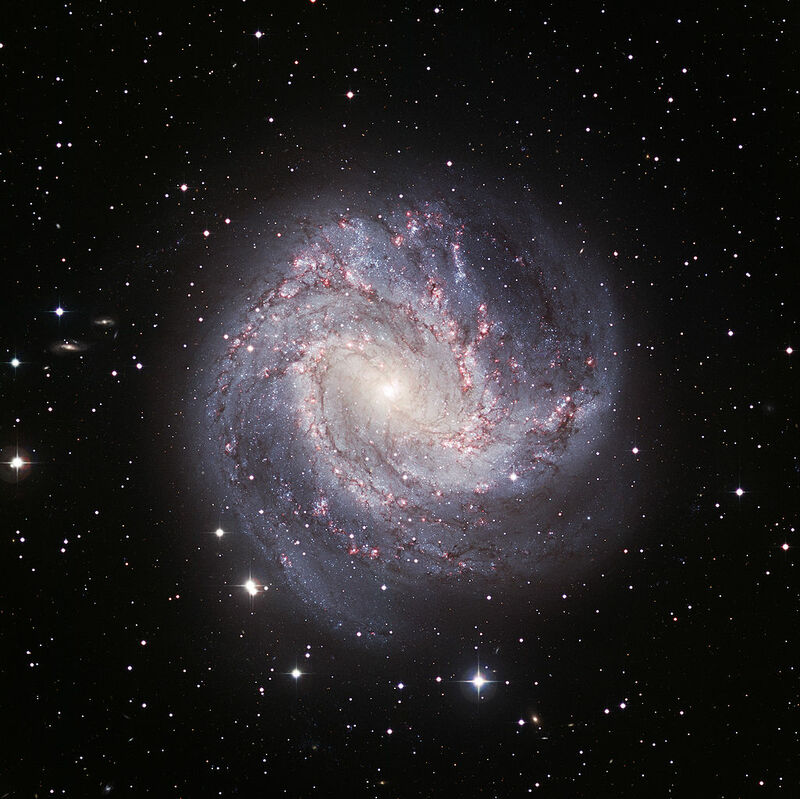 M83 is one of the nearest and brightest barred spirals in the sky and can be seen in 10×50 binoculars, which only reveal a patch of light with a brighter core. 3-inch telescopes show a larger patch of nebulosity with a bright centre, while 6-inch telescopes begin to hint at the bar structure and the dark patches around the galaxy’s central region. 10-inch telescopes reveal the galaxy’s well defined spiral structure, dark dust lanes and the central bar. Located 30 degrees south of the celestial equator, Messier 83 is the southernmost galaxy listed in Messier’s catalogue, which makes it one of the most difficult Messier objects for northern observers because it never rises very high above the southern horizon. The galaxy lies near the border with Centaurus constellation, about three quarters of the way from the bright star Spica (mag. +1.04) in Virgo to Menkent (mag. +2.06) in Centaurus. It can also be found using the stars Gamma or Pi Hydrae. The galaxy is located 6.5 degrees south and 3.15 degrees east of Gamma (mag. +2.99) and 3.15 degrees south and 6.20 degrees west of Pi Hydrae (mag. 3.25). The best time of year to observe M83 is during the spring. 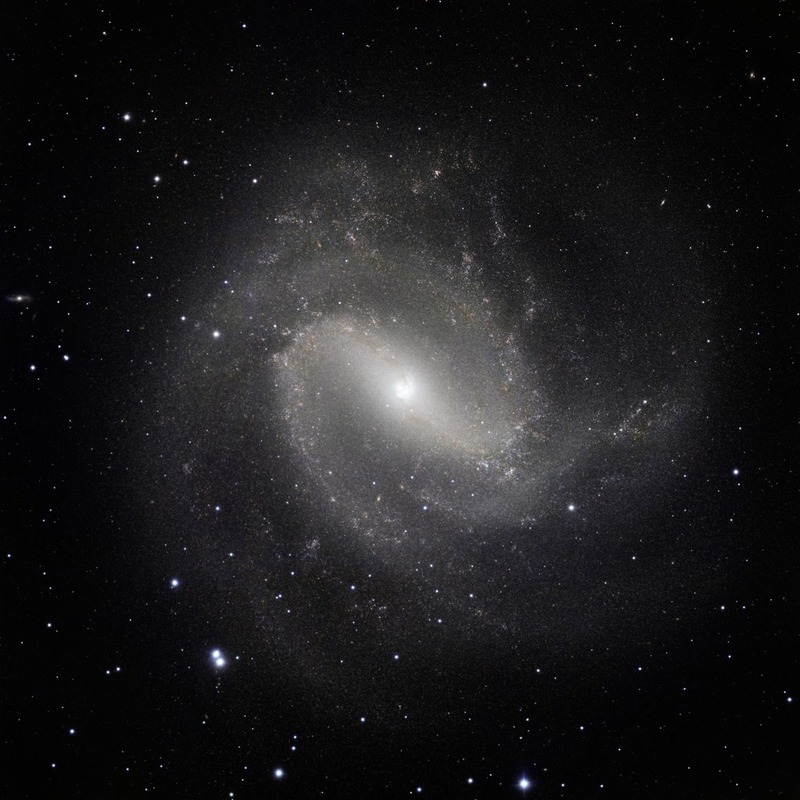 Messier 83 was the first galaxy to be discovered outside the Local Group and the third of all galaxies, after the Andromeda Galaxy (M31) and Le Gentil (M32), both located in the constellation Andromeda. The Southern Pinwheel Galaxy has a well-defined spiral structure and is classified as an intermediate spiral, between normal and barred spiral. The galaxy is receding from us at 337 km/s. Messier 83 is the central galaxy of the M83 Group, one of the two subgroups of the larger Centaurus A/M83 Group, which also includes Centaurus A and the irregular galaxy NGC 5253. The largest member of the other group is Centaurus A, a prominent starburst galaxy located in the constellation Centaurus. The two groups are physically close and do not appear to be moving relative to each other, which is why they are often identified as a single group. Nicknamed the Southern Pinwheel, M83 is undergoing more rapid star formation than our own Milky Way galaxy, especially in its nucleus. The sharp “eye” of the Wide Field Camera 3 (WFC3) has captured hundreds of young star clusters, ancient swarms of globular star clusters, and hundreds of thousands of individual stars, mostly blue supergiants and red supergiants. The image, taken in August 2009, provides a close-up view of the myriad stars near the galaxy’s core, the bright whitish region at far right. WFC3’s broad wavelength range, from ultraviolet to near-infrared, reveals stars at different stages of evolution, allowing astronomers to dissect the galaxy’s star-formation history. The image reveals in unprecedented detail the current rapid rate of star birth in this famous “grand design” spiral galaxy. The newest generations of stars are forming largely in clusters on the edges of the dark dust lanes, the backbone of the spiral arms. These fledgling stars, only a few million years old, are bursting out of their dusty cocoons and producing bubbles of reddish glowing hydrogen gas. The excavated regions give a colorful “Swiss cheese” appearance to the spiral arm. Gradually, the young stars’ fierce winds (streams of charged particles) blow away the gas, revealing bright blue star clusters. These stars are about 1 million to 10 million years old. The older populations of stars are not as blue. A bar of stars, gas, and dust slicing across the core of the galaxy may be instigating most of the star birth in the galaxy’s core. The bar funnels material to the galaxy’s center, where the most active star formation is taking place. The brightest star clusters reside along an arc near the core. Until recently, the outer regions of M83 were believed to lack star forming material. However, on June 16, 2008, NASA’s Galaxy Evolution Explorer detected large numbers of very young, newly formed stars in these regions. Observations with the Hubble Space Telescope have revealed that the galaxy’s core has a double nucleus, a feature it shares with the Andromeda Galaxy (M31). This does not mean that M83 has two supermassive black holes at its centre, but possibly that the central black hole may be surrounded by an orbiting disk of stars which gives the appearance of a dual core. Neither of the two nuclei is aligned with the kinematic centre of M83. The visible nucleus is offset from the kinematic centre by about 200 light years. The double nucleus of M83 may be explained by a merger with a smaller galaxy that occurred in the distant past. The second nucleus may be the remnant core of the other galaxy that was absorbed by the larger M83. The central 1,000 light years of M83 also has a double circumnuclear starburst ring. The central bar of the Southern Pinwheel Galaxy extends for more than a third of the galaxy’s length. It may be responsible for most of the star forming activity in the core of M83 as it funnels material to the central region. The Southern Pinwheel Galaxy is home to about 3,000 star clusters, some of which are less than 5 million years old. Six supernovae have been detected in M83 in the last century: SN 1923A in 1923, SN 1945B in 1945, SN 1950B in 1950, SN 1957D in 1957, SN 1968L in 1968 and SN 1983N in 1983. SN 1923A, a Type II supernova, was detected at magnitude 14 at Lowell Observatory in 1923. SN 1945B appeared on July 13, 1945, but was only discovered on photographic plates in 1990. It peaked at magnitude 14.2. SN 1950B peaked at magnitude 14.5 in 1950 and SN 1957D, detected about 3 arc minutes from the nucleus of M83 on December 13, 1957, reached magnitude 15.0. Both were classified as Type II supernovae. SN 1968L was a Type I supernova seen about 5 arc seconds from the nucleus. At its peak, the supernova had a visual magnitude of 11 to 12. SN 1983N was spotted on July 3, 1983 and peaked at magnitude 12.5. In addition to the supernova events, almost 300 supernova remnants have been detected in the galaxy. This side-by-side comparison shows the Southern Pinwheel galaxy, or M83, as seen in ultraviolet light (right) and at both ultraviolet and radio wavelengths (left). While the radio data highlight the galaxy’s long, octopus-like arms stretching far beyond its main spiral disk (red), the ultraviolet data reveal clusters of baby stars (blue) within the extended arms. The ultraviolet image was taken by NASA’s Galaxy Evolution Explorer between March 15 and May 20, 2007, at scheduled intervals. Back in 2005, the telescope first photographed M83 over a shorter period of time. That picture was the first to reveal far-flung baby stars forming up to 63,000 light-years from the edge of the main spiral disk. This came as a surprise to astronomers because a galaxy’s outer territory typically lacks high densities of star-forming materials. 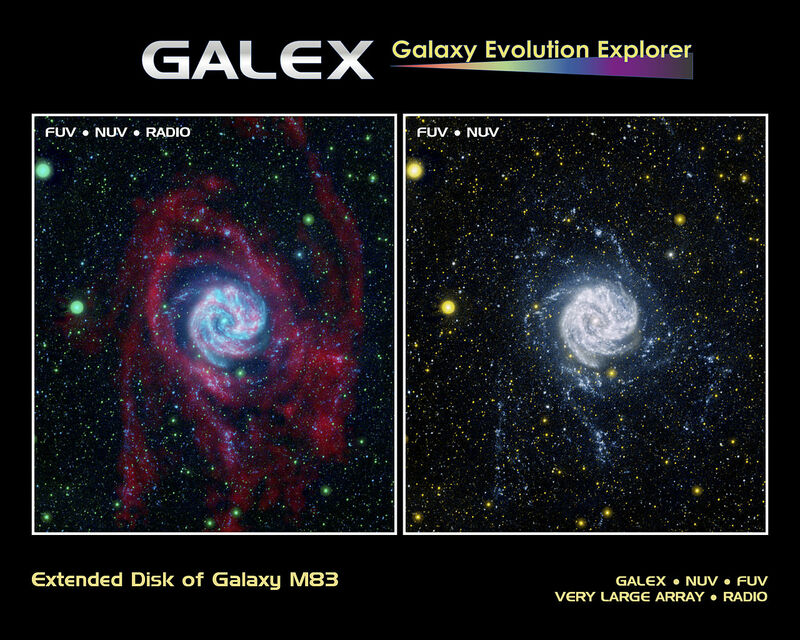 The newest picture of M83 from the Galaxy Evolution Explorer is shown at the right, and was taken over a longer period of time. In fact, it is one of the “deepest,” or longest-exposure, images of a nearby galaxy in ultraviolet light. This deeper view shows more clusters of stars, as well as stars in the very remote reaches of the galaxy, up to 140,000 light-years away from its core. The view at the left is a combination of the ultraviolet picture at the right and data taken by the telescopes of the National Science Foundation’s Very Large Array in New Mexico. The radio data, colored here in red, reveal extended galactic arms of gaseous hydrogen atoms, which are raw ingredients for stars. Astronomers are excited that the remote clusters of baby stars match up with the extended arms, because this helps them better understand how stars can be created out in the boondocks of a galaxy. 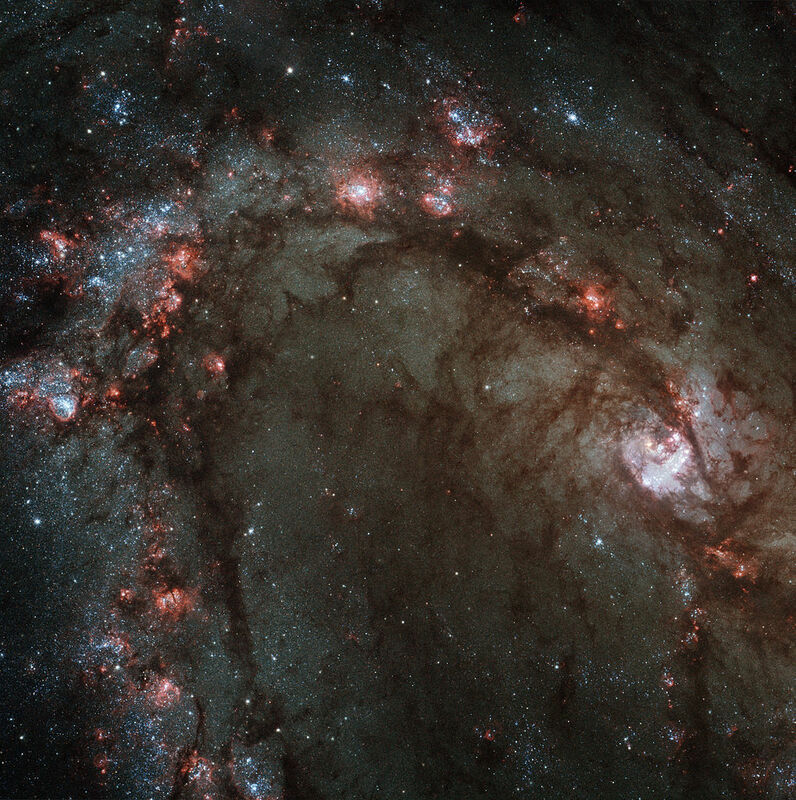 M83 is located 15 million light-years away in the southern constellation Hydra. 185 Centauri (Bode) is a very beautiful round nebula, with an exceedingly bright well-defined planetary disk or nucleus, about 7″ or 8″ diameter, surrounded by a luminous atmosphere or chevelure, about 6′ diameter. The nebulous matter is rather a little brighter towards the edge of the planetary disk, but very slightly so. I can see several extremely minute points or stars in the chevelure, but I do not consider them as indications of its being resolvable, although I have no doubt it is composed of stars. 5 Observations. 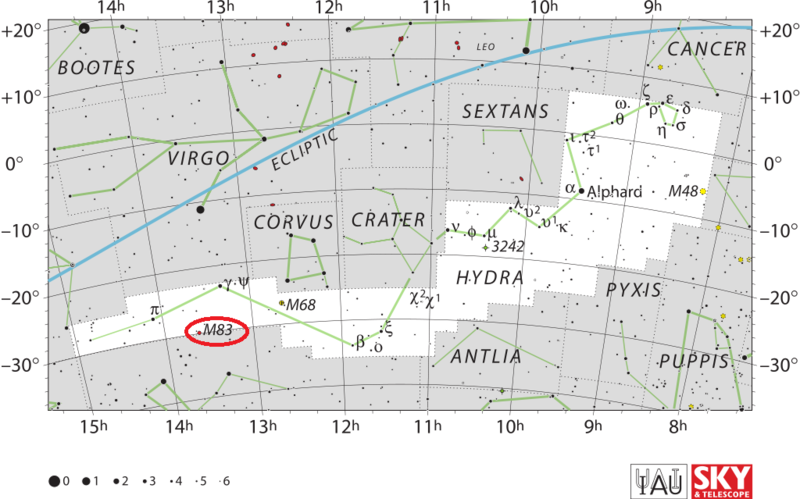 John Herschel catalogued M83 as h 3523 and later added it to the General Catalogue as GC 3606. Beginning with a wide view, this video zooms in through ground-based imagery to the Hubble and Magellan composite image of Messier 83, ending on Hubble’s view. 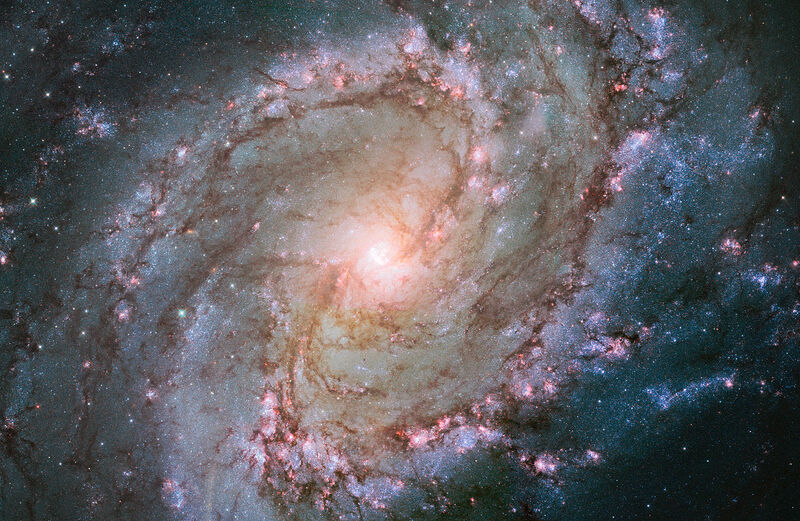 Messier 83 is a barred spiral galaxy that has hosted a remarkable number of supernova explosions, and appears to have a double nucleus at its core. The magnificent spiral galaxy M83 lies 15 million light-years away in the southern sky. Peering into one of the galaxy’s spiral arms, the Hubble Space Telescope’s new Wide Field Camera 3 is giving astronomers a detailed new look at the firestorm of star birth taking place in the galaxy. Stars are born in huge reddish nebulae and emerge as brilliant blue star clusters. Nicknamed the Southern Pinwheel, M83 is undergoing more rapid star formation than our own Milky Way galaxy, especially in its nucleus. The sharp “eye” of the Wide Field Camera 3 (WFC3) has captured hundreds of young star clusters, ancient swarms of globular star clusters, and hundreds of thousands of individual stars, mostly blue supergiants and red supergiants. The image, taken in August 2009, is Hubble’s close-up view of the myriad stars near the galaxy’s core, the bright whitish region at far right.